Bath time isn't exactly fun time for many pets or kids... until now, that is! Kids Animal Bath Towels give bath-shy kids something to look forward to once they're clean and about to be dry. These soft, comfortable and highly absorbent towels come in one size only: kid size! They're designed with attached hoods that keep wet heads warm and inside-out pockets that do double duty as paws. The towels even have tails... well, not much of a tail in the case of the Chicken model but you get the idea. 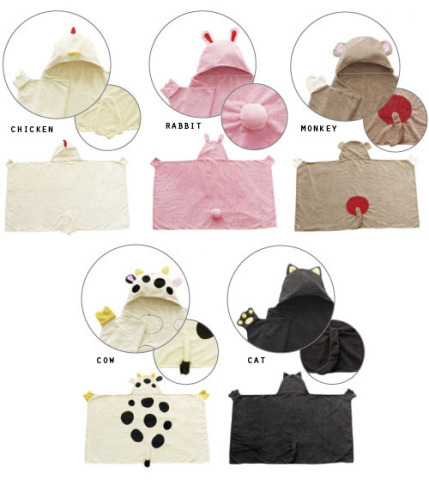 Kid's Animal Bath Towels come in five different cute & cuddly styles: Rabbit, Monkey, Cow, Cat, and the aforementioned Chicken. Order yours from OMG Japan, a Japan-based consumer products sourcer/shipper providing exemplary service in English. 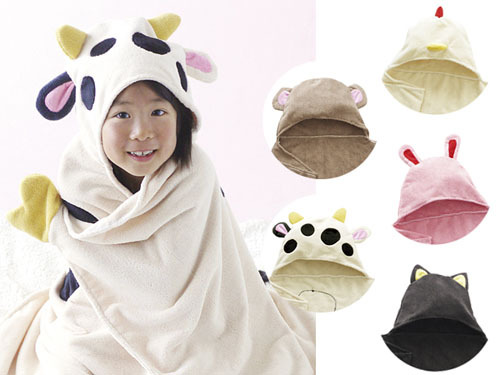 You can also find other kid's hooded animal bath towels and robes at Amazon. Adorable Animal Coffee Mugs With Convenient Hanging Spoon!